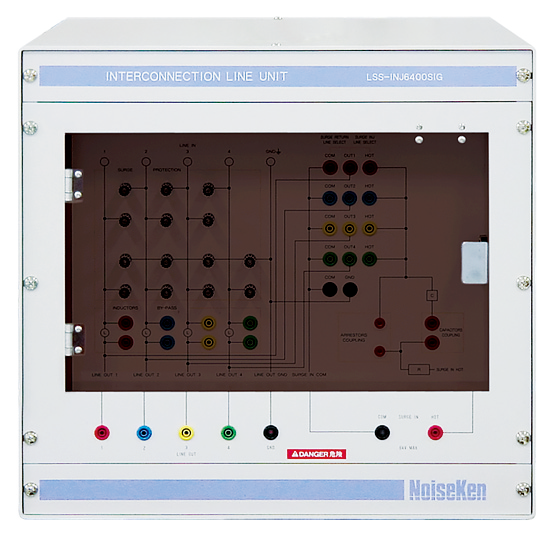 CDN for Interconnection Lines LSS-INJ6401SIG - NOISE LABORATORY CO.,LTD. Used for the surge test to interconnection lines defined in IEC61000-4-5 Standard. The EUT power capacity is DC50V/1A and enable to inject the surge to interconnection lines up to 6,600V. Possible to bypass inductor (20mH) with connecting the attached connection plug to inductor bypass terminal in DC output. Possible to equip the attached surge protective arrestor between each line and ground. * The conversion (05-T1578)cable is needed additionally. is a test method which assumes the injection of dozens of voltage level surge to interconnection lines. Please contact us if low voltage surge injection is required since the surge injection in LSS-INJ6401SIG can be more than 90V.